Targeting Carlin-style gold mineralisation which includes some of the largest gold deposits in the world. Favourably located at intersection of the Alligator Ridge and Battle Mountain-Eureka gold trends. Freeport surface sampling returned anomalous gold with high values of Carlin-style geochemical indicator elements arsenic, antimony, thallium and barium. A major silicified structure is associated with favourable north-south striking anticline “trap”. 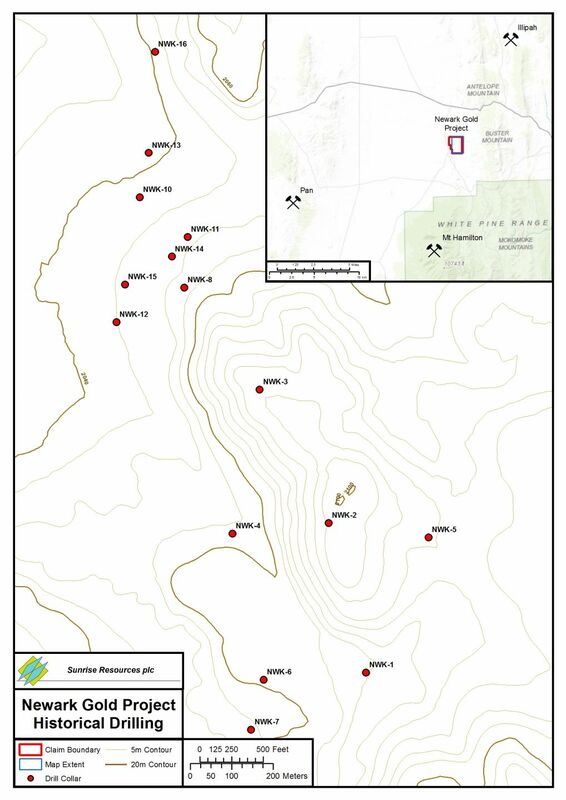 Hole NWK8 intersected 47 m of gold-anomalous jasperoid containing an average 0.14 ppm gold from 75m to the end of hole at 122 m.
A number of the follow-up holes failed to reach target depth. Deeper drilling is required to test the favourable target horizons. Company’s reconnaissance surface samples confirm prospective geochemistry. Nevada is the one of the largest gold producing regions in the world with production of 5 million ounces recorded in 2014. Most of this production comes from so-called “Carlin-style” gold deposits where microscopic gold particles occur in silicified, carbonaceous and decalcified silty limestones. Carlin-style deposits are visually unremarkable and were only recognized as a distinct style of gold deposit with the discovery of the Carlin deposit in 1961. Since then numerous discoveries have been made many of which are currently producing. They can be both large (e.g. Goldstrike which contains 39 million ounces gold at a grade of 3.3 g/t) and high-grade (e.g. Barrick’s recent Goldrush discovery which contains 8.6 million ounces gold at a grade of 10.6 g/t). The majority of known Carlin-style deposits occur in one of a small number of linear belts (“trends”) believed to reflect regional crustal discontinuities. Favourable factors include chemically receptive limestone host rocks, particularly where folded into anticlines and cut by suitable fault structures. The silicification of the host rocks that accompanies gold mineralisation is often manifest at or near surface by so-called jasperoids containing anomalous levels of the elements arsenic, antimony, thallium, barium and mercury. 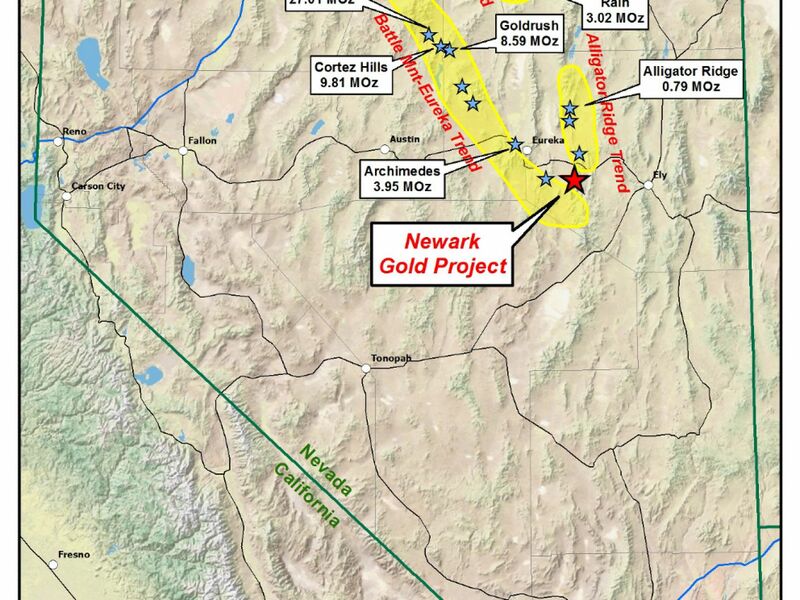 The Newark Gold Project is located at the southern end of the Battle Mountain-Eureka (Cortez) gold trend where intersected by the projection of the Alligator Ridge gold trend. It lies 40 km south of and along the same structural zone as the past-producing Alligator Ridge Mine, 12 km north of the Mt. Hamilton Gold Project and 20 km east of the Pan Gold Mine. 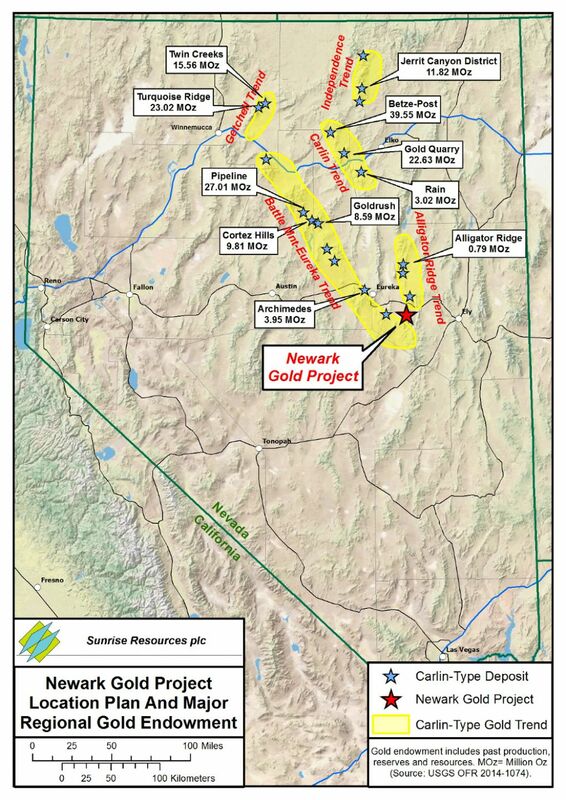 The Newark Project was originally targeted by Freeport-McMoRan Gold Co. in the 1980s following the discovery of gold anomalous values in silicified rocks in a favourable structural and stratigraphic setting. Surface sampling returned a high of 0.18 ppm gold along with high arsenic, antimony and thallium. Freeport drilled a total of 16 holes. Significantly, hole NWK8 intersected 47m of low-level gold (average 0.14 ppm) gold in jasperoid from 75m to the end of the hole at 122m. All holes targeted the Chainman Shale but not the more prospective lower levels of the stratigraphy (Joanna Limestone and Pilot Shale) which are now known to host most of the gold in the deposits in this region. 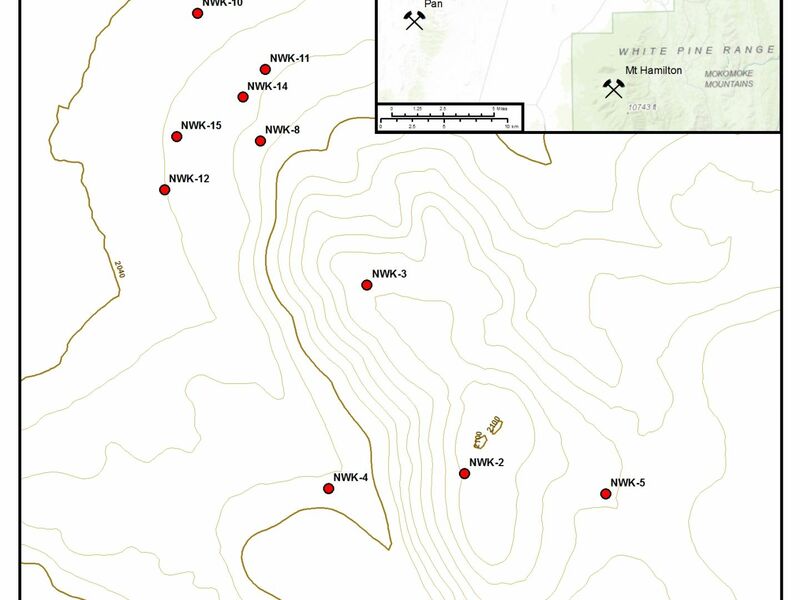 The Company has staked 29 mining claims covering the core of the prospective area. A field visit was carried out and a number of surface samples collected confirmed the anomalous geochemistry. Future exploration at Newark should include soil sampling and a deeper drill hole at the location of hole NWK8.